Pet Emergency? Call us right away at (512) 276-2633! 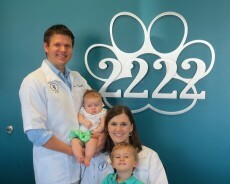 Modern medicine with old fashioned, compassionate care is the philosophy of the staff at the 2222 Veterinary Clinic. This full service veterinary medical facility is located in the Shops at River Place at the corner of River Place Blvd and Ranch Road 2222, across from the 3M Austin Center. 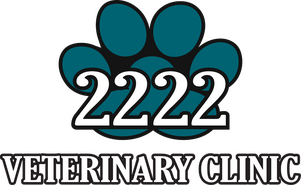 The 2222 Veterinary Clinic with its professional and courteous staff seek to provide the best possible medical, surgical, and dental care for your loved one. Please take a moment to contact us, to learn about our veterinary practice, schedule a tour of our facilities or find out more about how the 2222 Veterinary Clinic can serve you and your cherished pet. The owners of the practice, Drs. Frank and Mindi Metzler, strive to make this a family oriented practice. From the kid friendly environment to the teal on the walls (their wedding color), you will find this practice is an extension of their family. They look forward to welcoming you and your treasured pets into their extended home. At 2222 Veterinary Clinic, we treat your pets like the valued family members they are. Dr. Mindi Metzler graduated from the Texas A&M College of Veterinary Medicine in May, 2009. After practicing in San Antonio for 3 years, she and her husband (Dr. Frank) decided to pursue their dream of owning their own practice in the beautiful Texas Hill Country. "All of the Doctors and Techs are amazing and go the extra mile for you and your fur-baby! They went above and beyond to save my dog Bella. Highly recommended!" "I highly recommend this clinic. The staff is very compassionate and caring. A few of my friends recommended Dr. Frank and I'm glad I brought in my fur baby"
"They are the best!!! I am so very happy I took my dog there . Very caring, knowledgeable, and I trust them."